U.S. Secretary of State Condoleezza Rice has joined calls for a resolution of Zimbabwe’s political crisis stemming from President Robert Mugabe’s intransigence in holding on to power despite results which show his ZANU-PF party has lost parliamentary and presidential elections. Rice says Africa must step up to help alleviate the situation in Zimbabwe. While today’s repression by the Zimbabwe government is blamed on external forces and the Lancaster House agreement reached in London, that was to have guided distribution of white held lands, strife between factions in the liberation wars were evident from day one. Joshua Nkomo, leader of the Zimbabwe African Peoples Union – Patriotic Front (ZAPU-PF), the surprise loser to Mugabe’s Zimbabwe African African National Union – (ZANU-PF), but who was included in the government first at home affairs minister and later was Mugabe’s vice-president, early felt the adder’s sting. “…Nothing in my life had prepared me for persecution at the hands of a government led by black Africans,” Nkomo wrote in his memoir, My Life, of Mugabe’s accusatiopn that he was involved in a coup plot. “ZAPU and its leader, Dr. Joshua Nkomo, are like a cobra in a house. The only way to deal effectively with a snake is to strike and destroy its head,” declared Mugabe who unleashed forces on Nkomo’s Matabeleland homeland in Operation Gukurahundi, repoetedly killing more than 20,000 Ndebele civilians in an attempt to destroy ZAPU. There was a reconcilliation, with Nkomo being appointed deputy president to Mugabe in 1987, and declared a national hero at his death in 1999. Notwithstanding the reconcilliation, it would seem a cesation from its state of war has still not come, at least not for the majority, who had looked forward to a new life under a government of their own making. Condi Rice is not the only one calling on African leaders to step forward on Zimbabwe’s crisis. Former UN Secretary General Kofi Annan, who increasingly finds himself as peacemaker in the continent’s cancerous wars, has urged them to do more to address the Zimbabwe problem. He has warned that the situation is dangerous and could have an impact beyond the country’s borders. Annan made his comments to reporters in the Kenyan capital, Nairobi, where he had held talks with Zimbabwean opposition leaders. “On the question of Zimbabwe there has been substantial international attention,” he said. “The question which has been posed is: where are the Africans? Where are their leaders and the countries in the region, what are they doing? “They should tell Robert Mugabe, the country’s president, that it is important that the electoral commission, as a matter of urgency, issue the remaining results of Zimbabwe’s parliamentary and presidential elections,” the Gleaner had urged. The Zimbabwe liberation struggle took on particcular significance in the region in the 1970s with artists like Bro Valentino (Stay Up Zimbabwe) of Trinidad and Tobago and Jamaica’s Bob Marley and the Wailers, among others, raising their voices for freedom from Ian Smith’s racist Rhodesian regime. Indeed, many of the freedom fighters embraced Ras Tafari and the red, gold and green standard as they waged their bush war. The Wailers were special guests of the government when freedom came on April 18, 1980, performing Zimbabwe, at the country’s independence festivities. Anan, who played a pivotal role in recent weeks in resolving a similar crisis in Kenya, where the opposition insists it had been cheated out of victory by the incumbent, said action by African leaders had helped resolve the post-election crisis there, where mediation led to the formation of a coalition government. “You’ve just been through a crisis here, and you’ve managed to solve it, and I must say the credit goes to the Kenyan people, to the African Union – it was an African solution to an African problem,” Mr Annan said. Surprisingly, the African National Congress-led government of Thabo Mbeki of neighbouring South Africa has not been as forthcoming as unionised port workers who have refused to unload a shipment of Chinese arms destined for the Zimbabwe regime. Mozambique has turned the ship away and it was reported to be headed for Angola. However, the villified recently elected ANC president Jacob Zuma has been critical of Mugabe. 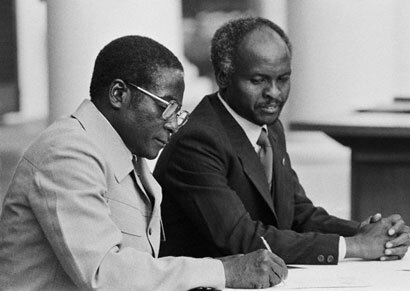 The ancestral connection of the majority of CARICOM nationals to the continent and the moral support brought to bear in the bush war period, a role acknowledged by the invitation to the Wailers to the independence festivities, makes it an imperative that our leaders join in making it clear to Mugabe that the war is over and there should be “no more internal power struggle, for thats the only way to over come the little trouble.” Or do we leave it to the Wailers again?